With the Software “Invoice Creator” the struggle of formatting is a thing of the past. Simply use our pre-formatted documents and you’ll only need to manually add the invoice recipient and invoice item. With all further billings, you can carry the data forward – saving you time and effort! Not only do we provide preformatted invoices, but also, templates for quotes, order confirmations, purchase orders, business letters, reminders and delivery notes. Create your own business communication and convert a packing slip with just a few clicks. All documents can also be duplicated at will or be used as templates. Managing data is becoming super easy! All information that has been entered once is stored individually for each customer and can easily be retrieved and re-integrated if needed. This way, you get to use the full range of automated data management and still take advantage from our high security standards. Because digital does not need to be complicated! Our Installation Manager helps you with the initial installation of the software, our Wizard assistant puts definitions together with you the default settings. The Invoice Creator will support you in all areas of billing. Leave multiple addresses, text modules, payment methods, footnotes, invoice line items and choose according to your needs-the matching blocks. The most frequently chosen blocks are automatically saved as standard options - so you save valuable time and yet remain flexible! For everybody with minimal html-skills, the Invoice Creator offers the possibility to create your own invoice templates and to integrate them into the program. And even those without computer skills can have their ideas come to life: The team of invoice-create.com provides - on request (for a fee) –a customization service. Mail your completed invoice directly from the program by email or take advantage of our postal service! For only 0,89 € per letter, we’ll spare you the trip to the post office. With our import function you can import prior invoices from Excel into the Invoice Creator and combine/merge all invoices with only few clicks into one single pdf-document. No more fear of the tax authorities! The Invoice Creator will support you in the secure and precise bookkeeping of your cash journal and support you with an advanced sales tax summary report. Your installed Invoice Creator frequently checks for updates from invoice-create.com. If Updates are available, you can either automatically or manually install them. This way you and your software always stay up-to-date. 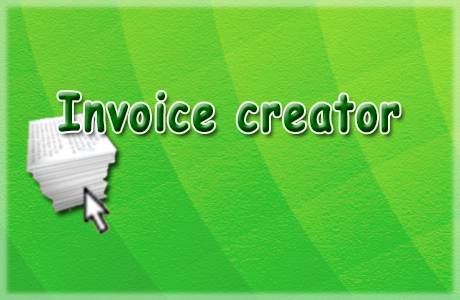 With the Invoice Creator we want to lessen your daily work load. For questions and problems concerning the software a ticket system ensures a quick response. The Forum also provides many interesting discussions by users for your assistance. Before the revelations by Snowden, we at invoice-create.com gave top priority to the security of your data. All data is stored only locally on the user's device without granting access opportunities to third parties. Also, our online version is secure: The hosting is carried out on German servers and the encryption is subject to highest quality standards.